An increasingly important concept in design is that of product creation. An approach based on product creation looks beyond chip or board design and considers the entire end product, including software applications, mechanical enclosures, and the underlying electronics. It also encompasses design team collaboration, design data integration into corporate systems, and on-time release to manufacturing. This is not to say that Cadence Design Systems or other EDA providers are going to jump into mechanical CAD or become product lifecycle management (PLM) suppliers. Cadence is emphasizing collaboration with existing providers, and is looking at ways to bring more value to portions of the product creation challenge where EDA has not traditionally played. Consistent with the EDA360 vision presented by Cadence in 2010, product creation tells us that understanding the end product and the software applications it will run will enable more effective solutions for system design and verification. The EDA industry, says Keith Felton, product marketing group director for PCB and IC packaging at Cadence, has traditionally focused only on hardware design. But that is only one part of the problem. EDA tools let designers draw schematics, but they don’t provide a conceptual, architectural “design authoring” environment that can start with the complete system and then partition it into the various fabrics needed to construct it. The EDA industry is just starting to address aspects of embedded software. And EDA tools generally don’t help designers integrate electronics hardware into a mechanical enclosure. What concrete steps can EDA providers take towards product creation? Software is part of any electronic product, and the Cadence System Development Suite provides hardware/software co-development and debugging through a set of four connected platforms – virtual prototyping, simulation, acceleration/emulation, and FPGA-based prototyping. Designers are running software on real-world hardware, with the Palladium XP verification computing platform as one supporting engine. The Allegro PCB design tools provide more examples. First, Allegro Design Workbench 16.6 allows designers to plug into corporate data management and PLM systems through Microsoft SharePoint. Secondly, Cadence has forged partnerships with MCAD providers such as PTC and Siemens to link mechanical and electrical hardware design. Design authoring and implementation. Instead of just drawing schematics, draw the logical definition of a complete system using a “system-level intent authoring environment.” Then partition the system description and run analysis tools. Design and supply-chain collaboration. Support geographically distributed teams, concurrent co-design, and library data management. Offer a direct interface between PLM systems and design authoring tools, or use an “ECAD collaborative workbench” to facilitate this connection. Feed metric information about ECOs and other design status issues into business decision systems. Electrical verification and signoff. With the acquisition of Sigrity in July 2012, Cadence can now provide detailed, comprehensive signal integrity and power verification across chip, package and board. Moving design data to manufacturing. 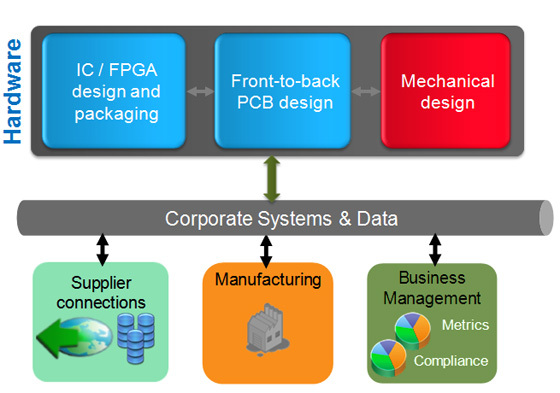 The IPC-2581 data transfer standard promises a single, intelligent, vendor-neutral pathway from design to manufacturing. In 2011 Cadence led the effort to create the IPC-2581 Consortium, which is leading the validation, adoption, and improvement of this new industry standard. The IPC-2581 data standard also represents an important step towards product creation. New products cannot start generating revenue in a timely fashion if they cannot move from design to manufacturing, and through the manufacturing process, quickly and smoothly. Before IPC-2581, PCB designers were forced to use multiple files and various proprietary formats to move data from design to manufacturing. As a single, open, vendor-neutral pathway to manufacturing, IPC-2581 is attracting broad industry support. A panel discussion at PCB West last year provided an update on the status of IPC-2581. It’s working for me but we did have it as opening a new page, which may have caused problems, so I’ve removed that. If it’s still not working, can you let us know which browser you’re on so we can test it?